Last month we followed George Pearce down to Luckenbach, Texas for some camp cooking. This month we are visiting with George's wife, Marta, to get some of her knowledge of Mexican style cooking and a couple of recipes. Marta says she started helping her mother cook at an early age. According to Marta, her mother was a businesslike cook; her job was to get the family fed and "fancy" touches were not a part of everyday cooking. Marta's interest in the finer treatment of dishes was inspired by her grandfather, a chef in Juarez, Mexico, across the border from El Paso. Marta speaks fondly of her grandfather's Sunday offerings. especially the red snapper ala Vera Cruz. The snapper was prepared whole with a colorful sauce, and grandfather carved and served the portions. Marta and husband George cook together most of the time. Each having their own version of the recipes brings about animated conversation. George raises most of the herbs used in their cooking. Around the patio you can find Mexican thyme, Mexican oregano, chives, tarragon, rosemary, basil and parsley, in season. Fresh herbs are always better than the dried variety. Marta claims not to have a favorite recipe. She says she likes them all. When asked about her preference for cheese in her Mexican recipes, she said "Queso Chihuahua" is the best. It's not available in most stores, but can be found in San Antonio. Muenster and Monterey Jack are fair substitutes. Marta also warns that jalapeno peppers will vary in internal heat, so you have to be very careful when using them. George warned from experience that you should not roast chile petins in the oven. They will form a pepper gas that will force everyone to leave the house for a couple of hours. 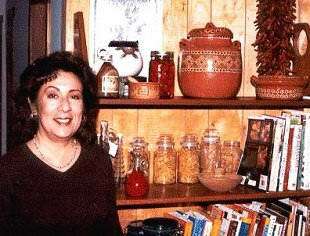 Marta offered up two recipes for sauces that form the basis for most Mexican dishes. Remove stems and seeds from the dried chiles. Rinse in cold water. Place chiles in a saucepan and cover generously with water. Bring pan to boil, remove from heat, cover and let stand about 30 minutes or until the chiles are tender. Meanwhile, place the husked tomatillos in a small saucepan with just enough water to cover. Bring to boil, reduce heat, cover and simmer gently for 5 to 10 minutes or until very tender. Place half the chiles with half the tomatillos in a blender with about ½ cup of the water the tomatillos were simmered in. Blend until pureed. Repeat with the remaining chiles and tomatillos. Process the chili sauce through a food mill to remove seeds and bits of the chile peel. This version of Salsa Roja is the basis for chile con carne, enchiladas, tamales, menudo, posole and chilaquiles. Double or triple the quantities, depending on how much you need. Mince 2 cloves of garlic and saut in 2 tablespoons of lard (or shortening, but lard is better) until tender. Don't brown it. Add the red chile sauce and season with teaspoon Mexican oregano and 1 teaspoon ground comino (cumin). Mix and simmer until heated through. If the sauce is too thick, you can add chicken broth to get the desired consistency. Add salt to taste. This Salsa Verde is the basis for Green Enchiladas, Pork Guisado and other recipes calling for green sauce. Drain and tomatillos and tomatoes, but reserve some of the tomatillo cooking water. Puree the tomatillos and tomatoes, along with the garlic. Use a little of the reserved cooking water from the tomatillos to smooth it out, if you like. Add the chopped onion and the finely chopped fresh cilantro. If the sauce is too thick, you can add chicken broth to get the desired consistency. One of Marta's grandfather's recipes is also one of George's favorites, with modifications of course. Roast and peel the chiles and remove the seeds and membranes. Cut them into narrow lengthwise strips. Separate the onion into pieces. In a bowl with a cover, drizzle enough olive oil on the chile and onion to just dampen them. Season with Mexican oregano. Mix well and refrigerate, mixing several times to get even coating of spice. This is served with any grilled meat or fowl. George's version of this recipe includes tender banana peppers in season. They don't need to be roasted and skinned, just seeded and sliced. Also a jalapeno or two, seeded and sliced. George sautés all his ingredients in the olive oil instead of refrigerating them. Another favorite recipe around the Pearce ranch is Chilaquiles (chee-la-key-ahs). Cut the tortillas into halves and then cut the halves into one-inch strips. Fry the tortilla strips in shorting or oil of your choice until they are golden brown. Drain on paper towels. Keep the strips warm in a slow oven until you are ready for them. Place a portion of the tortilla strips on a plate. Stack with shredded chicken, spoon on a generous amount of sauce, add shredded cheese and top with a dab of sour cream. There you have it, boys and girls. Authentic Texas-Mexican style cooking from the Pearce kitchen.